At 19:17 (27 November) Flight TE901 took off for a scenic flight from Auckland, proceeding over South Island, Auckland Islands, Baleny Islands and Cape Hallett to McMurdo (Antarctica) The flight would then return via Cape Hallett and Campbell Island to Christchurch. Approaching Ross Island it appeared that the area which was approved by the operator for VMC descents below 16000 feet was obscured by cloud. The crew decided to descend in a clear area to the (true) North of Ross Island in two descending orbits. The aircraft's descent was continued to 1500 feet on the flight planned track back toward Ross Island for its next turning point, Williams Field, McMurdo. The aircraft however, was actually flying 1,5 miles East of its flight-planned track. Shortly after reaching 1500 feet the GPWS sounded. Go around power was applied but the aircraft struck the slope of Mt Erebus at 1465 feet. The aircraft broke up and caught fire. 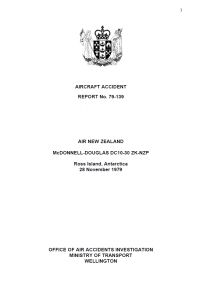 An accident investigation report by the Chief Inspector of aircraft accidents, came out in May 1980. The probable cause according to this investigation was: "The decision of the captain to continue the flight at low level toward an area of poor surface and horizon definition when the crew was not certain of their position and the subsequent inability to detect the rising terrain which intercepted the aircraft's flight path." Due to public demand, the New Zealand Government announced a further one-man Royal Commission of Inquiry into the accident, to be performed by judge Justice Peter Mahon. In April, 1981 he released his report. He concluded that: "The dominant cause of the disaster was the act of the airline in changing the computer track of the aircraft without telling the air crew." He continued: "In my opinion, therefore, the single dominant and effective cause of the disaster was the mistake made by those airline officials who programmed the aircraft to fly directly at Mt. Erebus and omitted to tell the aircrew. That mistake is directly attributable, not so much to the persons who made it, but to the incompetent administrative airline procedures which made the mistake possible. In my opinion, neither Captain Collins nor First Officer Cassin nor the flight engineers made any error which contributed to the disaster, and were not responsible for its occurrence." In para. 377 of his report, Mahon controversially claimed airline executives and management pilots engaged in a conspiracy to whitewash the enquiry, famously accusing them of "an orchestrated litany of lies" by covering up evidence and lying to investigators. Air New Zealand and the Civil Aviation Division were ordered to pay the costs of the inquiry, and the airline had to pay an extra fee of $150,000. Air New Zealand appealed against Mahon's findings to the Court of Appeal, which set aside the costs order against the airline. Mahon in turn appealed to the Privy Council in London. His findings as to the cause of the accident, namely reprogramming of the aircraft's flight plan by the ground crew who then failed to inform the flight crew, had not been challenged before the Court of Appeal, and so were not challenged before the Privy Council. His conclusion that the crash was the result of the aircrew being misdirected as to their flight path, and was not due to pilot error, therefore remained. But the Board held that Mahon had acted in excess of his jurisdiction and in breach of natural justice by going on to make findings of a conspiracy by Air New Zealand to cover up the errors of the ground staff. In their judgment, delivered on 20 October 1983, the Law Lords dismissed Mahon's appeal and upheld the decision of the Court of Appeal. Distance from Auckland International Airport to Christchurch International Airport as the crow flies is 744 km (465 miles).